The MONCLAC MCS floor bracket fits most radiators type 20-33 with an inner spacing of 60-100 mm between the panels. The height adjustment measured from the floor to the bottom edge of the radiator is 215-310 mm. This type is used for unfinished floors and has a plastic cover. With a special accessory kit for radiators type 11, the same bracket can be used for all radiators from type 11 to 33 and for all heights from 300-900 mm. 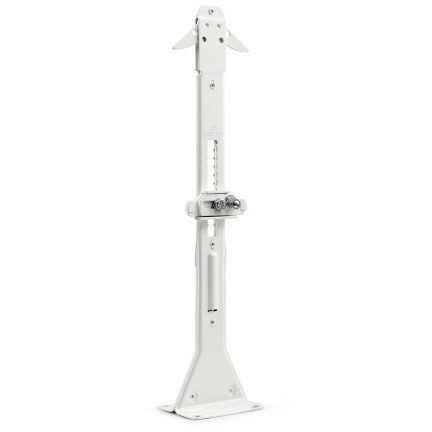 The MONCLAC floor bracket is developed in close co-operation with experienced installers who are familiar with the problems that could occur when installing floor-mounted radiators. The bracket can be adjusted both vertically and horizontally, and is very simple to adjust. Due to the fact that the same bracket can be used for many different radiator types you can save a lot of money with less stock holding. Installation time is shorter, not only because of the great flexibility of the bracket, but also because the radiator package can remain unpacked through the whole installation process. These factors save the installer time and money.